It’s about that time!!! Are YOU ready to cleanup? Anchorage Citywide Cleanup Week is approaching and were excited!!! Citywide Cleanup Week throughout the Municipality of Anchorage includes: Girdwood, Bird Creek, Indian, Chugiak, Eagle River, Birchwood, and Eklutna. Here are some quick FAQ’s that will help you get started. Where can I pick up orange bags? Where can I dispose of my bags when I’m done cleaning? -You can dispose your trash to one of the following stations: Central Transfer Station, Anchorage Regional Landfill, or the Girdwood Transfer Station. Will Solid Waste Services charge me when I deliver my orange bags during the week? -Trash in official orange trash bags will be accepted for free disposal at Solid Waste Services facilities. Is commercial waste accepted at this time? and must not exceed 1,000 pounds. Uncovered loads will be subject to fines. Are we responsible for disposing trash? Can we dump industrial/commercial debris? -No, there will be no industrial, commercial, construction, demolition debris, including remodeling waste, fence panels, decks, or sheds will be allowed. Can I be fined for uncovered trash? -Yes, uncovered loads will be subject to fines. -Yes, but, children under the age of 14 must remain in the vehicle while at dump stations. How do I make a payment or pay a fine I received? -Payments may only be made with cash or local checks (with a valid driver’s license), debit or credit cards are not accepted. Can I dump my fridge/freezer? -Yes, there is a $20.00 charge for appliances containing Freon such as refrigerators and/or freezers. Can we dump hazardous waste? at the Central Transfer Station and at the Hazardous Waste Facility located at the Anchorage Regional Landfill. We’re extremely excited that you participated in this year’s cleanup. Thank you for doing your part in helping keep our city clean!!! Well that was a pretty interesting week!!! Didn’t expect all that snow to fall, but hey, we’re in Alaska so what else can we expect. Despite the unexpected blizzard we had…..DID YOU KNOW THAT THIS MONTH IS: National Lawn & Garden Month??? This month’s blog will help guide you on 1 thing daily you can do to help make the world, as well as your lawn, a greener & healthier environment. April 1: Organize or take part in a town beautification day. April 2: Visit your local farmers’ market. April 3: Compliment a neighbor on his or her garden. April 4: Get together with neighbors to purchase compost and mulch in bulk quantities. April 5: Green up your street or a local park by picking up trash. April 6: Celebrate other important “green” holidays such as Earth Day (April 22) and National Arbor Day (April 26). April 7: Start a neighborhood garden club. April 8: Have fun doing a gardening project with a child. April 9: Design and plant a bird-friendly garden. April 10: Grow a “multicultural” garden. April 11: Plant a garden to attract native butterflies. April 12: Plant flowers that bloom at dusk, including moonflower, night-blooming phlox, and evening primrose. April 13: Garden at your workplace. April 14: Plant a garden that reflects your family’s or the region’s cultural heritage. April 15: Just sit in your garden and quietly observe the activities of wildlife and insects for half an hour. April 16: Learn about houseplants that clean the air, and introduce them to your home or workplace. April 17: Delve into a gardening style or technique you’ve always wanted to try, such as topiary, bonsai, or water gardening. April 18: Become an informed consumer by learning about invasive plants. April 19: Go on a sniffing tour of your neighborhood when bloom is at its peak, and try to match an aroma in the air to a specific flower. April 20: Take an armchair garden tour: Spend a few hours in the bookstore poring over gardening books. April 21: Learn how to take stunning photos of your plants and gardens. April 22: Earth Day! Vow to minimize pesticide use to protect wildlife, the water supply, and human health. A low-maintenance landscape needs little intervention. April 23: Start an herb garden indoors. April 24: Plant extra vegetables for freezing, canning, or storing. April 25: Seek out and purchase locally grown foods. April 26: Encourage local schools and restaurants to purchase locally grown produce. April 27: Encourage beneficial insects by planting herbs and flowers throughout your gardens. April 28: Start a compost pile. April 29: Learn about water saving techniques and tools. April 30: Clean your gardening tools; oil wooden handles, tighten heads, and sharpen blades. Do you sharpen your mower blade? 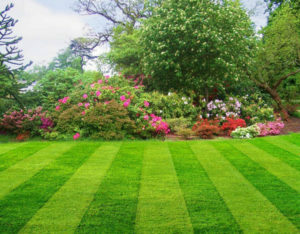 Is Your Lawn Ready For Summer?? Salt Rock Versus Liquid De-icer? DIY! DO IT YOURSELF? Or let the professionals do it? How well do you know lawn care? Take the test! Why Hire a lawn care company?